We’ve changed the submission process a bit for CBA. Now we are calling for submissions for three of our upcoming volumes at once, to be able to make better long-term plans. We’ve also appointed one main editor for each volume. The selection will still be made collectively, but the main editor will have the final say on what goes into their specific volume. CBA vol 34 – Re: Creation & Idleness NO MORE SUBMISSIONS FOR THIS VOLUME. Description: It’s time to put on your leisure suit and get to work on whatever. Whatever you want. Whatever. Is it working? No! It’s not working at all. Maybe it’s a sci-fi utopia. Or is it a fantasy? It’s all the time in the world. Odd moments are even. Time is money and everyone’s a billionaire. Spare some time? Here: free time for everyone! High quality time! No work and all play. The release of this issue will coincide with the AltCom 2016 festival (July 28-31) and is the antithesis of the festival’s WORK theme. CBA vol 35 – Bleed NO MORE SUBMISSIONS FOR THIS VOLUME. Description: Blood is of the essence. 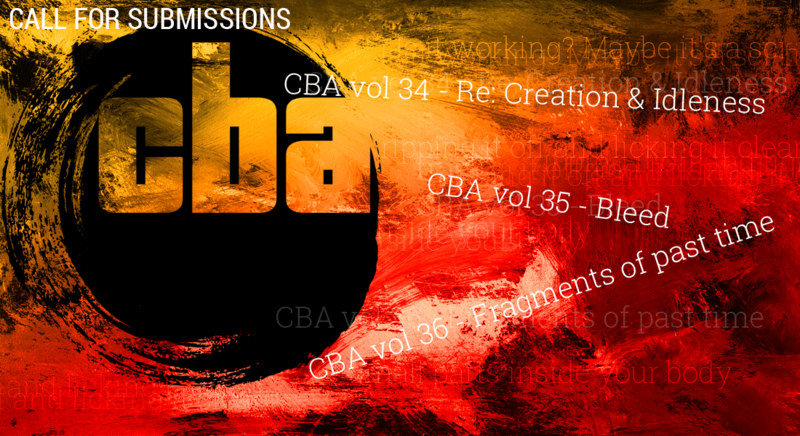 CBA vol 36 – Fragments of past time NO MORE SUBMISSIONS FOR THIS VOLUME. Unfortunately, we still can’t pay you anything for participating. You will get 10 free copies, and we hope that you’ll find being in CBA an opportunity to do some non-commercial work and to experiment with the comics as an art form. Consequently, we do accept comics that have already been published elsewhere, as long as we like them and they fit into the themes. Feel free to mention which theme you intend your comic for, but please note that the volume you have in mind may not necessarily be the one your comic ends up in. Hi! What format and resolution would you like? Pages and language? Tnx! Ok, i just saw link, Sorry my bad. Previous Previous post: AltCom 2016: WORK anthology – call for submissions!